Stockholm is a world class city that has caught the attention of all those travelling to Northern Europe. While in the city there is much to do, so this blog will try to point you in the right directions as to how you can spend your time in Stockholm. Certainly a walking city, visitors do well to wander around enjoying themselves and soaking in the great architecture and the interesting personal style of the Scandinavians. Stockholm also has great museums and world class attractions to visit. A few more things to do in Stockholm include. The tale of massive warship Vasa is both a story of the achievements of man and man’s limitations. 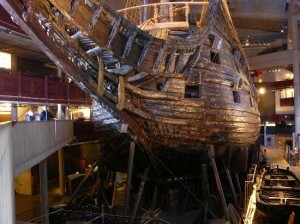 Built in 1628 the massive war ship was the pride of Stockholm. Of course that pride dissipated quickly as the Vasa did not even travel one mile out of Stockholm’s harbour before capsizing in front of thousands of onlookers. Since 1990 the retrieved wreckage of the Vasa has been made into a museum of both the boat itself and sea faring in of itself. Visitors to the Vasa museum are always awe inspired by the sheer size of this cannon laden hulk of a ship. Admission for an adult costs around $18 dollars – anyone under 18 is admitted free. The museum is open from 8:30 am to 6 pm. Built in 1792 the Nationalmusuem showcases a variety of great Swedish works as well as the works of international masters such as Cézanne, Degas, and Rembrandt. Housed in a remarkable old Swedish building many visitors feel that the building itself is a piece of art. Though the Swedish section is highly lauded many feel that the international section is not up to the high standards of other major European museums as many of the pieces are lesser works from great artists. The museum is open from 11 am to 5 pm daily – except Monday – and costs around $14 US dollars for adults while anyone under 18 gets in for free. Rosendal’s Garden is a picturesque greened in space situated on the island of Djurgården. This is a great place to come to unwind after a few days of walking and wandering around Stockholm. Perfect for spending a few hours during the late afternoon it is even permissible for visitors to pick fruits, flowers, and vegetables from the communal gardens. The gardens are open from 11 am to 6 pm each day, though there may be altered hours depending on the season.